Today I was in the area so I decided to pop in for another tasting. 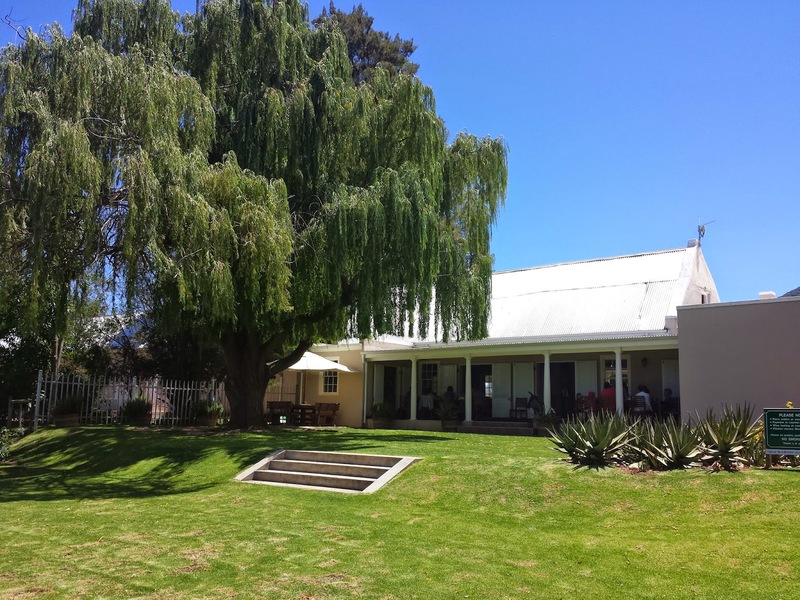 The place seems to be doing really well, you will notice that their wine is in most restaurants in the area (Oudtshoorn) and each time I have visited the winery (both times on a week day) they have had guests sitting on the stoep enjoying a bite to eat and sipping on a glass of their wine. 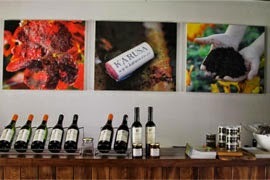 Karusa has an outdoor area to enjoy a glass of wine and food and an indoor area for wine tastings. They serve food here also so I ordered a grilled Ostrich wrap which was delicious and a very decent size! Southern Slope Sauvignon Blanc 2014 R58 a bottle - not too acidic, tropical nose, intense and good. Lighter on the palate in comparison to the nose. Stonerock Viognier - wooded 2014 at R58 a bottle - nice and smooth, a little fresh on the finish. Terre Noire Syrah 2012 at R85 a bottle - heavier on the nose with blackcurrant and black pepper. Medium body, nice flavour, earthy tones, nice. The Ancients Pinot Noir 2012 at R85 a bottle - smokey and spicy. Nice but unusual for a Pinot Noir. Double Black Petite Syrah 2014 at R115 a bottle was rich and heavy, had cherry and blackcurrant flavour. It was good, but I didn't feel it was R115 good. Grenache Noir/Shiraz/Mourvedre - unwooded red 2013 at R40 a bottle - it was served a little warm. It was a nice, light and easy drinking red, white pepper on nose and palate, a little spicy. Muscat Blanc semi - sweet 2014 at R45 a bottle - lovely nose, nice easy drinking wine, pear, apple smell and taste, it is a light wine. Only 11.5% alcohol which is a bonus. The lady who served me was very lovely. She remembered me from my last visit and provided an informative tasting.It was nice of her to give me a few extra wines to taste also. I recommend one visits this winery when in Oudtshoorn.